An RO water purifier on the other hand physically removes all germs and viruses in the water by filtering the water. An RO water purifier also remove salt molecules which are many times smaller than the smallest of germs. So the answer to the question 'RO or UV water purifier which is better? ', is that RO water purifier is better than UV water purifier. 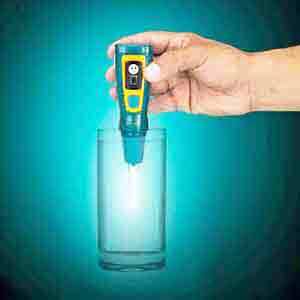 The most important part of a UV water purifier is the UV bulb or lamp or bulb. It is this UV bulb which produces the ultra-violet light source. To protect the bulb from direct contact with the water there is a quartz glass sleeve around the UV tube-light which protects it against water entry and consequent electric shorting. The quartz sleeve should be of the correct quality of glass to allow the glass to be transparent to short wave UVC light of 254 nanometres, the most effective UV light wavelength to kill germs in the water. We have an image of an advanced UV water purifier. All the important parts of the UV water purifier are marked. This UV water purifier is unique in that it has a special wiper mechanism which can wipe the surface of the quartz glass sleeve surrounding the UV lamp. As explained later in this page, the quartz glass sleeve protecting the UV lamp can get dirty and scaled up, and this will make the UV water purifier ineffective by blocking the UV rays. So to overcome it, this particular UV water purifier has a patented UV wiper mechanism to clean UV quartz sleeve, which can manually clean the surface of the UV quartz sleeve while the UV water purifier is working. This is a very good solution for one of the main drawbacks of UV water purifier, that is the UV lamp's ultraviolet rays can get blocked by the protective quartz glass sleeve around it. 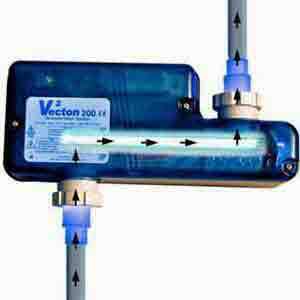 There are several manufacturers of UV tube light used as the light source in water purifiers. Some of these manufacturers may not be producing UV light but just colored light. 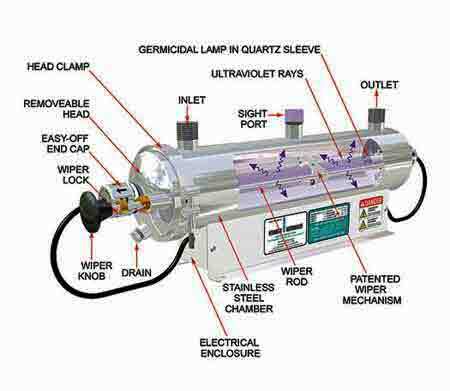 Make sure that the UV bulb or the UV lamp inside a UV water purifier is from a well known manufacturer whose quality you can trust. The image on the left shows the wavelength spectrum of light. The most effective wavelengths for disinfection by light is within the UV-C band of the spectrum, with the most effective wavelength being 254nm. Short wave ultraviolet radiation, in the 200 to 280 nanometers range is known as the "C" band or UV-C (UVC). The UVC range of shortwave ultraviolet light is also called UVGI - Ultra Violet Germicidal Irradiation. UVC band of ultra violet light rays penetrates into the cells of microbes and alters their DNA molecule thus preventing multiplication and ultimate death. Shown on the right is the unique Steripen portable UV water purifier model 'ULTRA'. This UV water purifier is portable and works off a rechargeable battery. On the right is shown the UV water purifier in action disinfecting a glass of water. You need to keep the UV light lit inside the glass for a minimum of 45 seconds to be sure that the water in the glass has been disinfected. So it is a very convenient water purifier to be carried along with you in your travels, to purify your drinking water just before you drink it. You will be the centre of attraction in a restaurant when you are using it, but you may not be very popular with the restaurant owner.